To spend moments of relaxation, sport and fun on a bicycle, book this Weekend on the Ligurian Riviera following the route of the famous Milan – San Remo bicycle event! The Flower Riviera awaits: experience the most thrilling moments with the top cycling champions of the Milan – San Remo! Don’t miss this fantastic weekend of passion on two wheels. 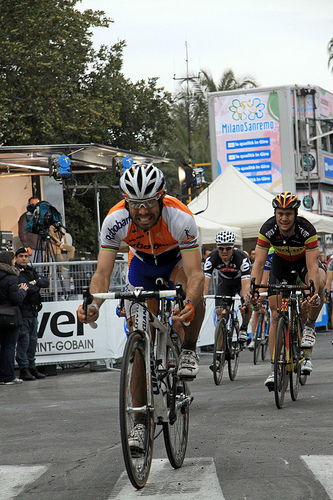 Arrival in the morning with time at your disposal to take advantage of the welcoming atmosphere of the Riviera; in the early afternoon , you can attend the Spring Classic. You can choose to wait along the legendary climb of the Poggio section, or along the approach to the finish line to marvel at the great champions of the Milan – San Remo in a atmosphere that is undoubtedly sporty and above all joyful. Afterwards you can attend the award ceremony and visit the village where the event is held. Dinner in a typical restaurant of San Remo, where you can enjoy some of the most famous dishes of the Ligurian tradition. After dinner we suggest you try your luck in one of the gaming rooms of the Municipal Casino. Day 2: Sunday – And now onto your saddles!! On this day we suggest a route through a very beautiful landscape: you can try the new cycle path with a departure from San Remo heading towards San Lorenzo, skirting the coastline with its beautiful scenery. You’ll proceed towards Porto Maurizio, remaining close to the sea until you reach the halfway point, and then take the main road and return back to the City of Flowers. For the most enthusiastic there’s the chance to pursue the famous climbs that characterize the Ligurian part of the Milan – San Remo, the Poggio and Cipressa hills. Along the way, you’ll be accompanied by the sea and by it’s stunning views, and while climbing the two hills you will get a breathtaking view of the lovely towns of the Flower Riviera. The mostly level route reaches it’s peak on the “Cipressa” at an altitude of 350 meters above sea level. A late check-out from the hotel allows you to cool down after the ride and prepare for departure towards your place of origin.